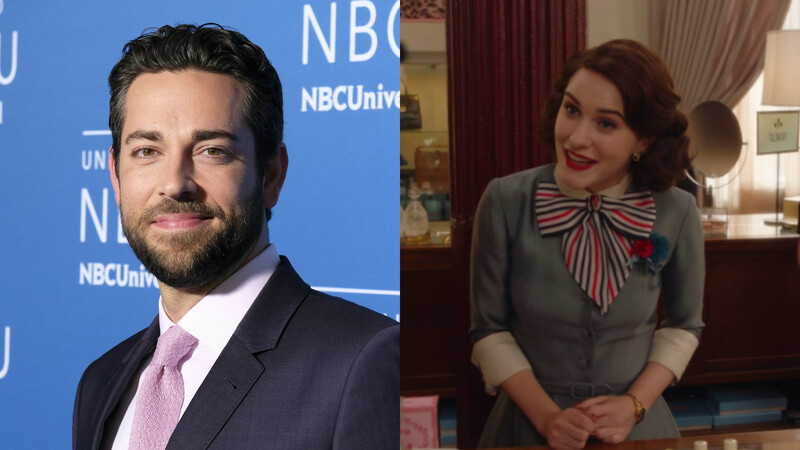 Let’s hope the Intersect contained a stand-up routine or two, because Chuck Bartowski is headed to The Marvelous Mrs. Maisel — sort of. Amazon Studios has just announced that Zachary Levi would be joining the Golden Globe-winning series for its upcoming second season in a recurring role. Levi’s casting comes just days after the series picked up a Peabody Award for its critically acclaimed first season, earning a swift Season 3 renewal. The first season of Mrs. Maisel followed the titular Midge Maisel (Rachel Brosnahan), an affluent NYC housewife, who stumbles into the world of stand-up comedy when her seemingly perfect life falls apart. The end of the first season saw Midge shed her stage name and embrace her future as a gifted stand-up, as her estranged husband Joel (Michael Zegen) discovers her secret and sees she’s the gifted comedian he aspired to be. According to the press release, the Chuck star will be playing an “eclectic Manhattan doctor who suddenly starts orbiting the Weissman/Maisel world.” While little else is known about Levi’s character, we have feeling he’s going to be immediately in over his head the second he comes into contact with the lovingly chaotic Weissman/Maisel clan. The series also stars Tony Shalhoub and Marin Hinkle as Midge’s parents, Abe and Rose Weissman, and Alex Borstein as Susie Myerson, Midge’s manager and employee at The Gaslight Cafe. While details for Season 2 of Mrs. Maisel has been tightly under wraps, series creator Amy Sherman-Palladino told The Hollywood Reporter that the upcoming season will feature Midge and Susie taking their comedy show on the road, following the tour routes of real-life ’50s stand-ups Joan Rivers and Buddy Hackett. It also seems that Levi won’t be the only major star heading to the series, if Sherman-Palladino’s former collaborators have their way. The showrunner also told THR that Gilmore Girls star Lauren Graham is trying to work her way into a guest spot on Mrs. Maisel. We can’t wait to see more of Midge and meet Levi’s mystery doctor when the 10-episode Season 2 of the hit series is released on Amazon.